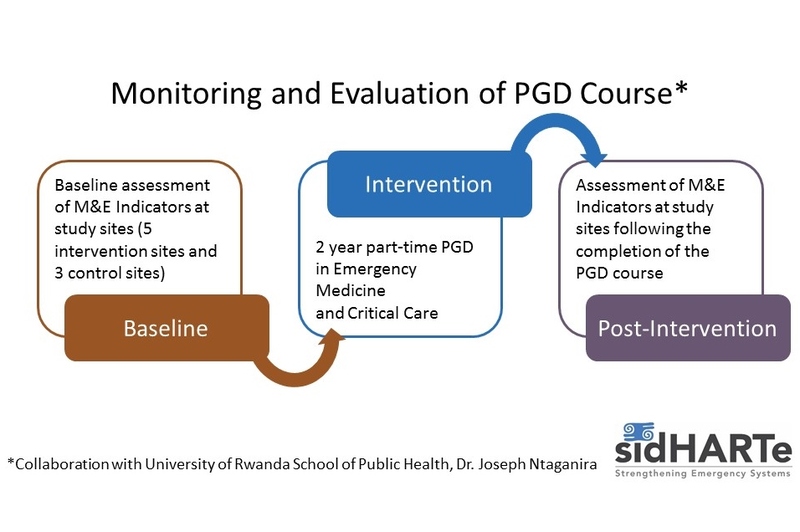 In 2011, the Rwandan Ministries of Health and Education invited sidHARTe to assist the University of Rwanda’s College of Medicine and Health Sciences in the development of a groundbreaking Post-Graduate Diploma (PGD) course in Emergency and Critical Care Medicine. Designed for general practitioners (GPs), the PGD is a two-year part-time program that gives doctors the opportunity to have a combination of classroom-based learning and hands-on clinical practice in emergency care. The unique part-time nature of the course allows GPs to continue to provide patient care in their district hospitals, alternating this work with their participation in the program in Kigali. This incentivizes graduates to remain committed to their district hospitals. The course is designed for sustainability. As such, a subset of graduating GPs from the PGD program will continue their training in a Master of Medicine (MMed) in Emergency Medicine, the cornerstone of the Human Resources for Health (HRH) program. This group will serve as both advocates and future instructors for the development of Emergency Medicine in Rwanda. The remainder of the PGD graduates will return directly to the district where they will apply their new skills to strengthen emergency services and frontline care in underserved, rural areas. sidHARTe and Columbia University are implementing partners in both the PGD course and the HRH academic consortium. The PGD and the MMed are part of Rwanda’s overall Human Resources for Health strategy to build the health education infrastructure and workforce by training Rwandan clinicians and health educators. sidHARTe also supports the Rwanda Emergency Care Association (RECA) founded by Dr. Mbanjumucyo Gabin, Emergency and Critical Care Medicine Resident. RECA’s Executive and Management Committees are largely made up of current Emergency and Critical Care Medicine residents and aims to promote and improve emergency care through teaching, research and education. Educational programs such as the PGD course in Emergency and Critical Care Medicine are central to improving the quality of emergenc care available at district hospitals.